THE B-MOVIE NEWS VAULT: Shout! Factory and Arcana Studio to release HOWARD LOVECRAFT AND THE FROZEN KINGDOM in 2016! Shout! Factory and Arcana Studio to release HOWARD LOVECRAFT AND THE FROZEN KINGDOM in 2016! SHOUT! FACTORY TEAMS WITH ARCANA STUDIO ON NEW ANIMATED FEATURE - "HOWARD LOVECRAFT AND THE FROZEN KINGDOM!" Arcana Studio and Shout! Factory are teaming up to create an all-new animated feature based upon Arcana’s popular graphic novel, HOWARD LOVECRAFT AND THE FROZEN KINGDOM. Written, directed and produced by Sean Patrick O’Reilly, this adaptation will introduce a new generation to the imaginative Lovecraft universe through the new animated adventures of a young Howard Lovecraft. Shout! Factory will handle the cross-platform distribution when the film is completed, bringing this Lovecraftian tale to numerous formats: DVD, Blu-ray, Video on Demand, and perhaps even a limited theatrical release! 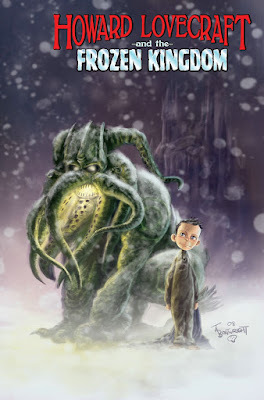 Here's the brief synopsis of the graphic novel that this animated film will be based on: "After visiting his father in Arkham Sanitarium, young Howard Lovecraft ignores his father's warning and uses the legendary Necronomicon to open a portal to a strange, frozen world filled with horrifying creatures and grave danger. Alone and scared, Howard befriends a hideous creature he names Spot, who takes him to the castle of the king, where he is captured and sentenced to death." If done right, this could be incredibly awesome! And, if it is well-received, then we very well could be seeing even more fun adventures of young Howard Lovecraft! HOWARD LOVECRAFT AND THE FROZEN KINGDOM is currently in pre-production, with a tentative release set for October of 2016! As I receive more info about this production, I'll be sure to share it here! Stay tuned for further updates Cthulhu fans! Arcana Studio and Shout! Factory announced the casting of Golden Globe-winning actor Ron Perlman (FANTASTIC BEASTS AND WHERE TO FIND THEM, HELLBOY) and Oscar-winning actor Christopher Plummer (BEGINNERS, UP) in the upcoming animated film HOWARD LOVECRAFT AND THE FROZEN KINGDOM. Perlman is set to voice the role of Shoggoth, and Plummer has been cast in the role of Dr. Herbert West! Too cool!